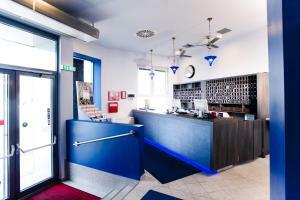 The Lenas Donau Hotel enjoys a quiet location directly at the Alte Donau waterfront, only a 5-minute walk from the Alte Donau Underground Station. It offers free WiFi in all public areas, and a terrace overlooking the Alte Donau. Guests can also take advantage of the buffet breakfast including popcakes, sweet dumplings filled with plum marmalade, and frozen yoghurt, and the bar, which is open until midnight. The bright and modern rooms feature soundproof windows, satellite TV, and a bathroom with hairdryer. The Alte Donau is a former part of the Danube River and offers many leisure opportunities, including sailing. The Donauzentrum Shopping Centre is in the immediate vicinity of Hotel Lenas Donau. The nearby underground station (line U1) provides direct connections into Vienna’s city centre. The Wagramerstraße Bus Stop is also close by. Free public parking is available on site.